How Many Wallets Are Lost Each Year? Cutting back on the number of things you carry with you can shrink your mental check list so you're less likely to leave something behind. Wallets can be downsized into card cases or money clip wallets that slip easily into the pockets of clothing. Remove the degrees of separation and upgrade your wallet to something you carry on your person as opposed to in a separate bag. To stop yourself from pulling out your wallet and setting it down somewhere, or worse, risk having it fall out in the middle of the street, opt for a wallet with a chain attachment. 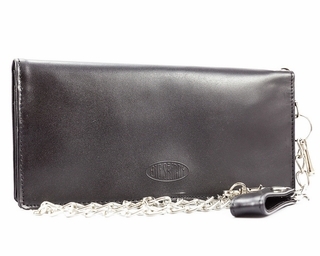 This style of wallet allows you to chain it up to the inside of your purse, jacket or backpack. It looks pretty cool too, so that's a nice plus. Not only are you always losing your wallet, your phone and your keys go missing a lot too. A phone case wristlet wallet may be exactly what you need, especially for date nights and whenever you don't want to carry a bag around with you. It has a slot for your smartphone and a zippered pocket that's perfect for keys and loose change. Wrap the strap around your wrist and you won't have to worry about dropping it or leaving it somewhere.